This witty end table is sure to spark conversation. 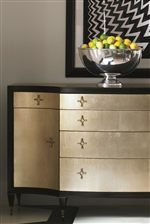 It features an ombre finish that fades from warm silver to an elegant gold. One of these tables can be used as a single accent, two can be placed together to hug one another for a yin and yang configuration. The Classic Contemporary End Quote End Table by Caracole at C. S. Wo & Sons Hawaii in the Hawaii, Honolulu, Oahu, Hawaiian Islands, Waikiki, Diamond Head, East Honolulu area. Product availability may vary. Contact us for the most current availability on this product. The Classic Contemporary collection is a great option if you are looking for Traditional furniture in the Hawaii, Honolulu, Oahu, Hawaiian Islands, Waikiki, Diamond Head, East Honolulu area.